Cellulite is related to a sluggish lymphatic system. An infrared sauna stimulates the lymphatic system therefore it is a great addition to a cellulite treatment program combined with myofascial work and lymphatic drainage massage. The massage helps to break up the fatty deposits and waste products. 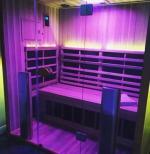 The sauna and lymphatic work help to flush it out of the system. Thanks, Martha, for your submission. Indeed it seems that the infrared sauna is a good addition to cellulite treatment programs. I have also read about a treatment program based on a device that works with a combination of radio frequencies and infrared energy, plus tissue manipulation to smooth out the skin. Join in and write your own page! It's easy to do. How? Simply click here to return to Cellulite Stories.